Children aged 6-9 years less 25% (in a boat with two adults) Children 10-14 years less 15%, and 15 years and over pay full price. If you have a specific date in mind, please contact us and we will let you know about the availability. We can only confirm a booking once a deposit has been paid. Rafting equipment, guides, in-trip transport, meals and accommodation where applicable. 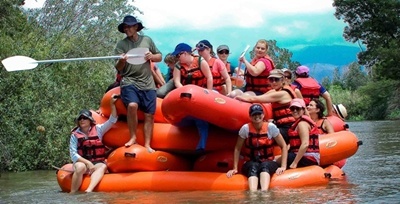 We make use of 2-man inflatable rafts (crocs) with cooler box, dry bags, personal floatation devices and paddles included. The inflatable rafts are easy to control, safe and loads of fun for paddlers of all strengths and ages. River guides with the necessary experience and knowledge of the river will guide you on your day of adventure. No previous experience is needed and only a moderate level of fitness is required. 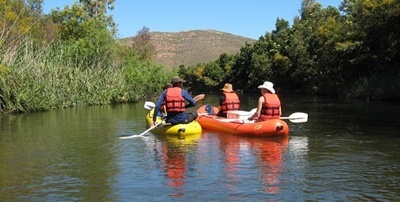 We believe in responsible and sustainable tourism development and please help us to keep our rivers clean and pristine. No glass bottles allowed on river.